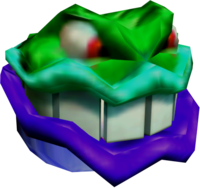 Oysters are large, sinister-looking clams found in Donkey Kong 64. Six Oysters can be found in a locked chest in the area Gloomy Galleon. In order to get inside this chest and reach the Oyster, Tiny Kong must shrink down in size using a Mini-Monkey Barrel and swim through the key hole on the chest's lock. Once inside, Tiny will find several Oysters opening and closing their mouths in a repetitive fashion; inside the mouth of each Oyster is a pearl. Tiny must carefully swim inside an Oyster and grab the pearl within. Only the Oyster's teeth can injure the monkey. Once Tiny grabs all the pearls, she must return them to the Mermaid's seashell citadel where she can exchange them for a Golden Banana. ↑ Bihldorff, Nate, Jason Leung, and Drew Williams. Donkey Kong 64 Official Nintendo Player's Guide, page 69. This page was last edited on August 26, 2018, at 22:31.